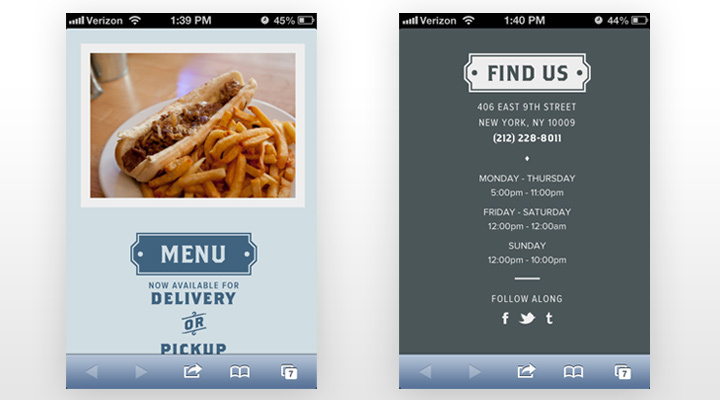 It’s crucial for a restaurant to have a presence on the web, and more importantly, smartphone access. By the end of 2013, it is predicted that there will be 1.4 billion smartphones active around the world. It’s essential for restaurant websites to be mobile-friendly so that customers can browse menus, photos, and find their information easily. There are two websites that I have found that have a wonderful desktop experience, as well as mobile compatible sites – Smokey Bones Bar and Fire Grill and Whitmans New York. 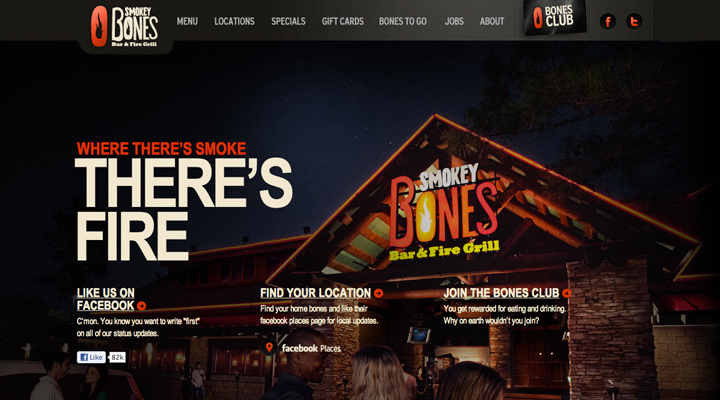 Smokey Bones’ website is a parallax style website – a single page site with scrolling sections. The navigation sticks to the top of the webpage no matter where you scroll, making it very easy for a visitor to quickly switch to a new page. 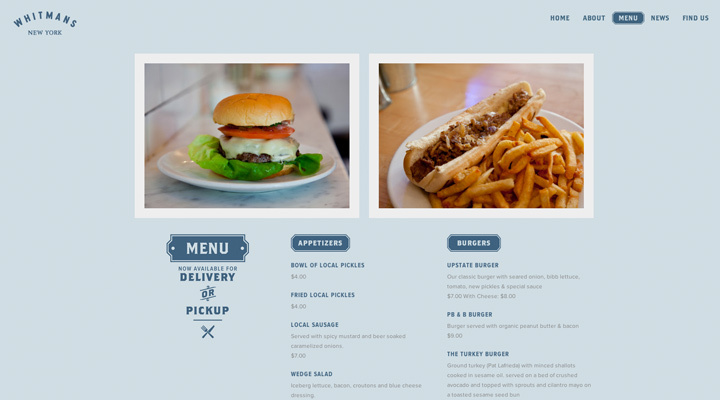 It is friendly and inviting with large images that definitely make you hungry, and most importantly easy-to-read menus with descriptions and the additional option to download it to your desktop. It’s an extensive website that has been thoroughly thought out and has plenty of small details that set it apart from the typical restaurant website. 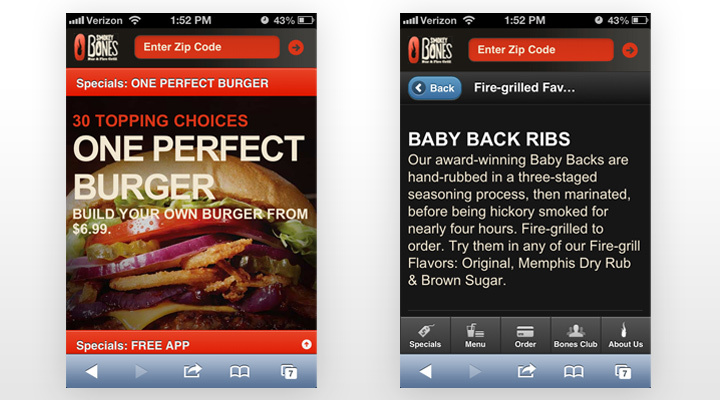 Smokey Bones also has a separate mobile website for those who visit on their smartphone. (Although typically, at TVI, we advocating building an overall responsive site so that your web presence isn’t limited by iOS/android/device size.) It’s built like an app and loads incredibly fast – very important for users who don’t have a fast connection. Next up – Whitman’s New York. It’s very similar to the Smokey Bones website in that the navigation is fixed at the top of the page and the user scrolls to each section. It’s a super clean design with consistent styling and elements, and has images that convey the feeling of simplicity but still make you hungry. I can easily browse the menu, quickly find them on a map, and get their contact information – signs of an effective restaurant website. Since the website is responsive, it easily scales down for view on a tablet or on a mobile phone. It’s very easy to scroll down through the site and view everything, however the site lacks a few visual cues to let the user know that they can just scroll up / down or left / right to view content (the News section, for example). Other than that, it’s a beautifully designed mobile site and features everything a potential customer could possibly looking for. A well thought-out restaurant website is important for connecting with and acquiring new customers. It should be an experience and not leave a user frustrated. The websites for Smokey Bones and Whitmans do a great job of taking their business and converting it into a digital experience.